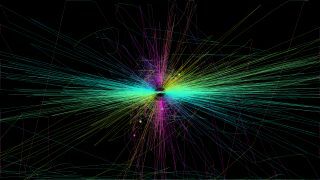 No, you're not peering into a distant galaxy - these visualisations are of all the movements a Reddit user's mouse made while they played various video games. The games seem to fall into two distinct categories: side to side bowtie shape games, and circular nest-like games. Above is Agar.io, which clearly falls into the latter camp, and below is a clear example of the bowtie formation taken from Team Fortress 2. Pretty! Check out more of Gking19's mouse movements below.